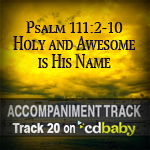 Scripture Songs for Worship : Psalm 111:2-10 "Holy and Awesome is His Name"
Psalm 111:2-10 "Holy and Awesome is His Name"
I have just discovered your Scripture Songs through a friend. 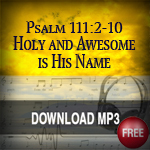 What a pleasure it has been to listen to God's word being sung so beautifully word for word. Your labour of love has been such an encouragement and blessing to many of us. 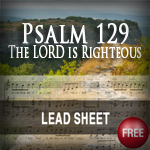 May God richly bless you, and give you continuous passion and love for Him, and His glory. 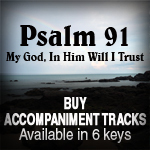 I found your Scripture Songs on youtube when I was searching for praise music to deepen my personal time with God. Singing His Word through your music has brought me to new levels of worship and adoration of our glorious Father. To God be all glory. Amen, to God be all the glory! 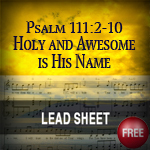 He is worthy of all praise and glory! Thank you for the comment. The LORD bless you. Hi Esther, thanks again for these beautiful songs. 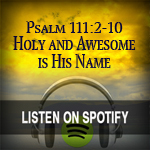 Singing along and memorizing them brings me closer to the Lord. God bless you and your family. Hi Amy, you are very welcomed. 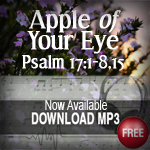 Am very encouraged that you are blessed by these Scripture songs. The LORD bless you.